Thinking about the Seven NE States surely had all our BP going high and we were ardently hoping we will end up with something at least. It happened again with Assam. Thinking I had half the dish planned, I wasn't really giving a lot of importance to the order of states I was doing, until I realized that I still had a couple of states in the first week to be done. I decided I better do it in order if I ever want this to be done on time. I remember going through Sunita's space during ICC and knew she didn't have anything in the category I wanted to make. Then I read about Boror Tenga / Assamese Tomato Curry With Lentil Dumplings by Aparna and decided to do it. However, she had written that this is served with rice or roti and there was not any specific bread that I could pair it with. One link led to something and I finally saw myself in the Assamese Recipes in FB. I immediately sent a message to the admin and was thrilled to get a prompt reply. I asked for some bread or something other than rice that I can make. 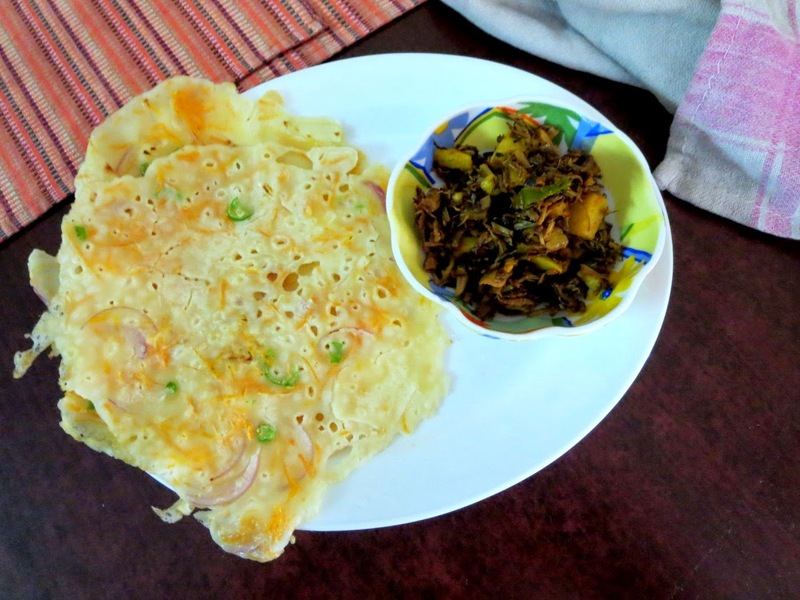 I was suggested to make Kholasapori Pitha, a rice pancake made with Night Jasmine and few other ingredients. I was told that one can do without these flowers as well, however Assamese add these natural ingredients to make it more healthy. I asked if I can serve it with Boror Tenga and was told that these Pithas are mostly served with Aloo pitika, a dry potato fry. The Admin was kind enough to send me links and pictures as well. I then searched for these names in hand and landed in many other blogs which proved quite helpful. I finally selected Madhu's space for dishes. I was hoping to make Boror Tenga, Rice, Pithas and some aloo pitikas. However, just a couple of days before this, Amma had made Banana blossom Vadas. When I saw the blossoms all cleaned and kept, I suddenly remembered reading about some connection with Assam cuisine. I wasn't wrong, I landed in Koldil Bhaaji from Madhu. 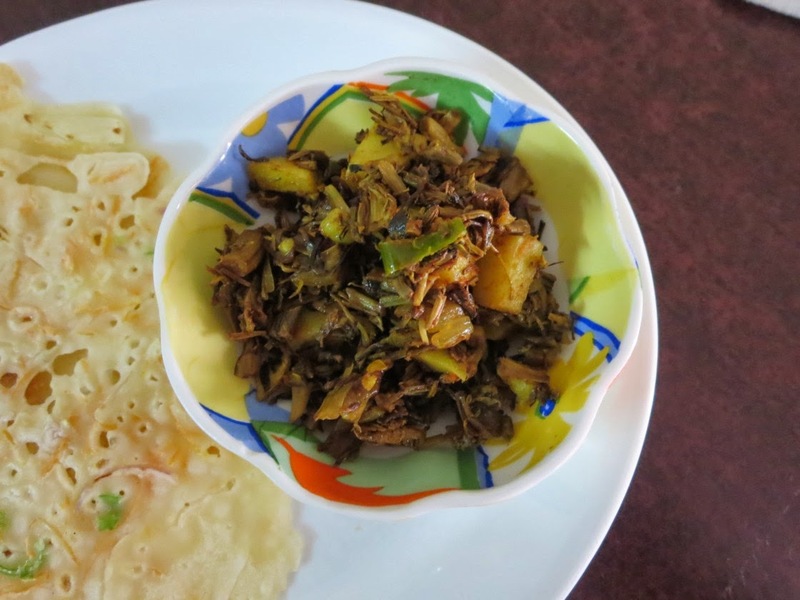 She said this bhaji is very famous in their cuisine and I reasoned that when they can serve a dry aloo pitika with the Pitha, I can surely serve this Bhaaji. Trust me, it was such a delicious combination. It was a simple meal, rather it was a brunch for me. Of course, Amma, Athamma, and Konda enjoyed eating this. They, in fact, felt I could have made it for all. The Bhaaji was a first for all of us. 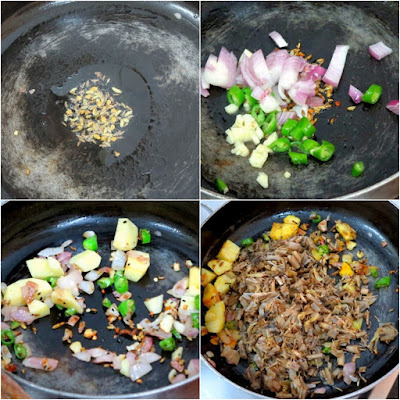 We are not used to making/eating a dry dish with rice or rotis as such. Still, it was very good experience. A bit on the Assamese cuisine. This is again predominantly nonvegetarian in nature. And they do not use much of oil or spice. Thinking about this reminds me of our Assamese neighbour. That Aunty used to make fish curry and especially calls Dad for dinner. Dad sort of used to this mildly spiced fish curry during his early college days. I can't imagine hubby dear even tasting it. Anyway reading this state, got me remembering those friends. Maybe I could've tried getting in touch with that aunty to know about recipes. Anyway, I made this for a brunch and we all enjoyed this combination. Of course, it was only we who had it and gave a small piece for tasting to Hubby dear. Clean the banana blossoms and keep it ready. Peel and cut the potato into cubes. Heat a nonstick pan with 2 tsp oil. Add panch phoran and when it sputters add finely chopped chilli, onion, and garlic. Next add the banana flower and the potato, mix well. 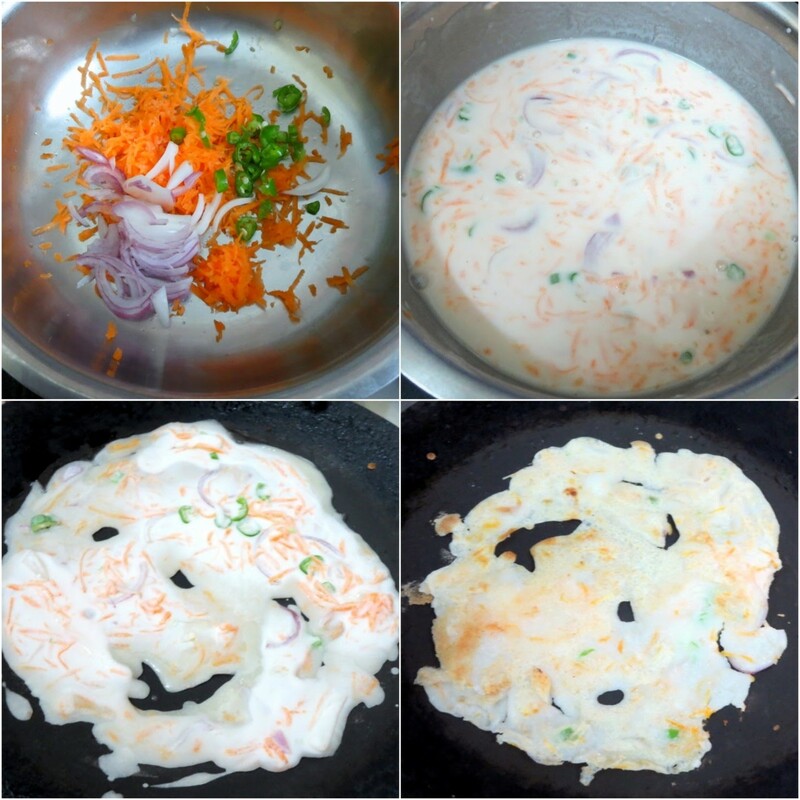 In a bowl, take all the ingredients and make a lump less batter of rice powder, chopped onion, grated carrot, salt, and water. Heat a Tawa pan. Smear oil and pour two ladlefuls of batter and spread round . Turn over when done and cook the other side. The batter needs to be on the thinner side so that it can spread well. If you find it hard to spread as you do with regular dosas, you can drop it as a circle and quickly swirl the tawa to make a circle. These pancakes actually went well with the dry subzi. 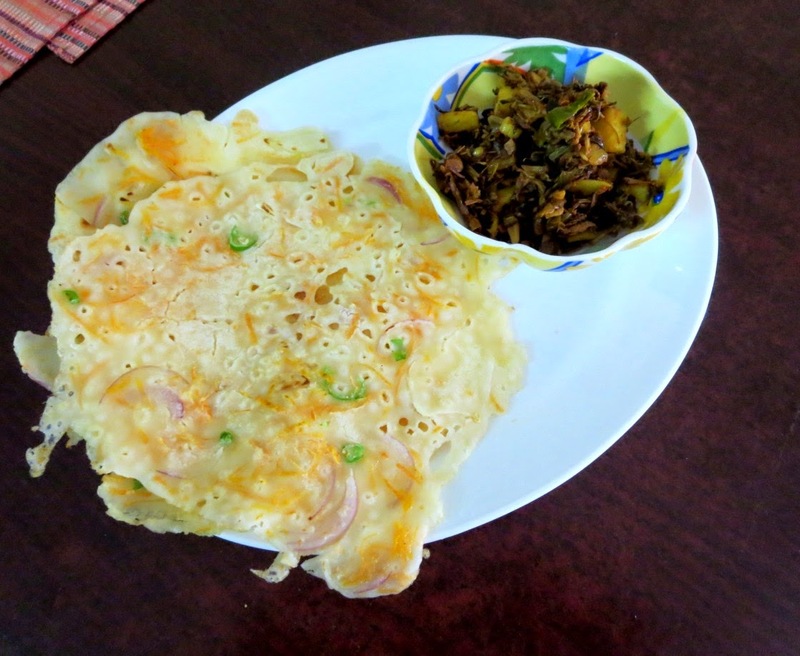 We do make Rice flour dosas regularly at home. Since this is such a simple one, I have not shared it.